It is supposed that fibroblasts present in tumour microenvironment increase cancer invasiveness and its ability to metastasize but the mechanisms have not been clearly defined yet. Thus, the current study was designed to assess changes in gene expression in five various cancer cell lines grown as a co-culture with the carcinoma-associated fibroblasts (CAFs) in vitro. A carcinoma-associated fibroblast cell line was isolated from a canine mammary cancer. Then, a co-culture of cancer cells with the CAFs was established and maintained for 72 hrs. Having sorted the cells, a global gene expression in cancer cells using DNA microarrays was examined. The analysis revealed an up-regulation of 100 genes and a down-regulation of 106 genes in the cancer cells grown as a co-culture with the CAFs in comparison to control conditions. The PANTHER binomial statistics tool was applied to determine statistically over-manifested pathways (p < 0.05). Bulk of the up-regulated genes are involved in the adhesion, the angiogenesis, the epithelial-mesenchymal transition (EMT) and generally take part in the developmental processes. These results were further confirmed using real-time qPCR. Moreover, a wound-healing assay and growth characteristics on Matrigel matrix showed that CAFs increase cancer cell migration and matrix invasion. The results of the current study showed that the co-culturing of cancer cells and the CAFs caused significant changes to the cancer gene expression. The presence of the CAFs in a microenvironment of cancer cells promotes adhesion, angiogenesis and EMT. Since canine mammary tumours in bulk are of epithelial origin this kind of cells is subjected to many studies. Over the last few years it has also been pin-pointed that concomitant changes occur within stromal cells, which contribute to the tumour microenvironment as well [1, 2]. Tumour microenvironment embraces inflammatory, fibroblastic, endothelial cells, adipocytes and other. Changes within these stromal cells have been postulated to increase the tumorigenic phenotype of the epithelial cell, promote malignant transformation, induce epithelial-mesenchymal transition (EMT) and promote tumour spreading and metastasis . It is worth noting however, that in almost all the tumours, the main cell type of cancer stromal compartment is fibroblast. These cells are usually atypical and are termed carcinoma-associated fibroblasts (CAFs). We assume there is a cross-talk between the tumour cells and the CAFs, which promotes migratory, and invasive properties of cancer cells  though their exact role within cancer microenvironment has not been fully defined yet. Thus, the study was conducted to assess the changes in gene expression in cancer cells grown as a co-culture with the CAFs in vitro. As far as we know the study presented hereby is a pioneering microarray experiment in this field. Despite that our study involved five various cell lines, only one CAFs cell line was used, thus the results may be limited to this particular CAF model. Further studies in this field are required. The analysis revealed an up-regulation within a span of 100 genes and a down-regulation within 106 genes in cancer cells grown as a co-culture with the CAFs, comparing against set control conditions. In this manuscript we focused mainly on the gene sets involved in adhesion, developmental process and neurotransmissions. The results of our study can be extrapolated on human research because canine mammary tumours are being considered a spontaneous animal model of human breast cancer . There are many similarities between human and canine mammary cancers: in both species they represent a heterogeneous group in terms of morphology and biological behaviour , in both similar cancer-related pathways are activated [6–8] as much as both species live under similar environmental conditions. The cell lines used for this study have previously been given an account of [9–12]. Two canine mammary adenocarcinoma cell lines (CMT-W1, CMT-W2), an anaplastic cancer cell line (P114), a simple carcinoma cell line (CMT-U27) and a spindle-cell mammary tumour cell line (CMT-U309) were examined. The CMT-W1 and the CMT-W2 cell lines had kindly been donated by Prof. Dr. Maciej Ugorski and Dr. Joanna Polanska from Wroclaw University of Environmental and Life Sciences (Poland). The CMT-U27 cell line had kindly been donated by Dr. Eva Hellmen from Swedish University of Agricultural Sciences (Sweden) and the P114 cell line had kindly been donated by Dr. Gerard Rutteman from Utrecht University (The Netherlands). The cells were cultured under optimal conditions: a medium (RPMI-1640) enriched with 10% (v/v) heat-inactivated fetal bovine serum (FBS), penicillin-streptomycin (50 iU mL-1), and fungizone (2.5 mg mL-1) (reagents obtained from Sigma Aldrich, USA), in an atmosphere of 5% CO2 and 95% humidified air at 37°C, and routinely sub-cultured every other day. The methods of canine mammary cancer cells culturing have previously been given an account of [9–12]. A mammary tumour was surgically removed during mastectomy on a 12 years old mixed breeds female. The tumour then, was divided into equal halves, one of them was fixed in 10% neutral buffered formalin and routinely embedded in paraffin to perform histological assay. The other, was used to isolate and establish a carcinoma-associated fibroblast cell line. The cells isolation from cancer tissue has been described in our previous manuscript . The tumor sample was collected into the medium RPMI 1640 (Sigma Aldrich, USA) containing flask immediately after mastectomy. The RPMI 1640 medium had been used to maintain the same culturing conditions for mono- and co-culture. The tumour sample was then sliced and cultured overnight in collagenase containing medium RPMI 1640 according to the Limon et al. protocol (modified by Dr Eva Hellmen, Swedish University of Agricultural Sciences, Sweden). The following day, the medium was centrifuged and pellet was suspended in a fresh culture medium supplemented in FGF (10 nM/ml, obtained from Sigma Aldrich, USA), a medium that encourages preferential fibroblastic outgrowth. The tissue sample embedded in paraffin block was cut into five μm sections and baked in 37°C overnight. After dewaxing in xylene and rehydration in ethanol, for antigen retrieval, the slides were placed in 0.02 M citrate buffer, pH 6.0 and boiled in the decloaking chamber. The tumor type was classified based on the World Health Organization (WHO) Histological Classification and Mammary Tumors of the Dog and Cat classification [15, 16]. The mammary carcinoma grading was assessed in respect to tubule formation, degree of differentiation and mitotic index. 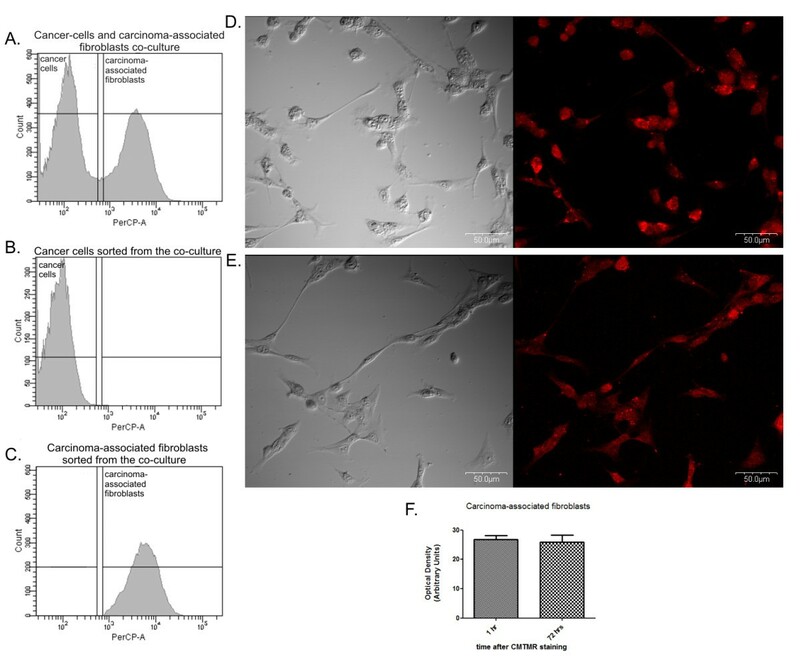 The carcinoma-associated fibroblasts and the canine mammary cancer cells were cultured on Lab-Tek (Nunc Inc., USA) 4-chamber culture slides and were then fixed with ethanol after the 24 hrs. The immunohistochemical examination of expression of Ki67, cytokeratin, vimentin, smooth muscle actin, s100 protein, p63 protein was performed on the tissue sample as well as on carcinoma-associated fibroblasts to confirm the origin of cell culture. The MUC1 expression was analyzed in the canine mammary cancer cell lines. The samples were incubated in the Peroxidase Blocking Reagent (Dako, Denmark) for 10 min at room temperature prior to the antibody incubation. After 30 min incubation in 5% bovine serum albumin (Sigma Aldrich, Germany), the following primary antibodies were used (diluted in 1% bovine serum): mouse monoclonal anti-Ki67 (Clone MIB-1) at the concentration 1:75; monoclonal mouse anti-human cytokeratin (Clone MNF116) at the concentration 1:50; monoclonal mouse anti-human vimentin (Clone Vim 3B4) at the concentration 1:50; monoclonal mouse anti-human actin (Clone HHF35) at the concentration 1:50; polyclonal rabbit anti-S100 (ready to use solution) all obtained from Dako (Denmark); monoclonal mouse anti-p63 protein (Santa Cruz Biotechnology, USA) and monoclonal mouse anti-MUC1 (Abcam, United Kindgdom) at the concentration 1:10. According to the manufacturer's instructions the slides were incubated with antibodies at +4°C overnight or 1 hr at room temperature. For the staining the anti-mouse or anti-rabbit EnVision kits (Labelled Polymers consist of secondary anti-rabbit antibodies conjugated with the HRP enzyme complex obtained from Dako) were used. To develop the coloured product, the 3,3'-Diaminobenzidine (DAB) substrate was used (Dako). Finally, the haematoxylin was used for nuclei counterstaining. For each immunohistochemical analysis as the negative control, the staining without the use of primary antibodies was done. The pictures were taken using Olympus microscopy BX60 (Olympus, Germany). The CAFs (105 cells) were grown on 75 cm2 culture flasks and the cancer cells (CMT-W1, CMT-W2, CMT-U27, CMT-U309, P114) were layered (5 × 105 cells) on the top of the CAFs (fibroblasts and cancer cells at 1:5 ratio ). An Orange CellTracker fluorescent dye CMTMR (Invitrogen, USA) was used to stain the CAFs' population before the cancer cell population was added. Initially, optimal staining conditions were determined by incubating CAFs in various concentrations of CMTMR (5-25 μM dye, according to the manufacturer's instructions) and checking the fluorescence signal after 72 hrs using FACS. The lowest concentration that gives positive results has been used in further experiments (5 μM). Staining was accomplished by incubation in serum/antibiotics-free RPMI medium containing 5 μM CMTMR (10 mM stock in DMSO; Sigma Aldrich, USA) for 45 min at 37°C. Subsequently, the medium was aspirated, and the CAFs were washed with PBS twice and incubated with complete RPMI for 1 hr and then again washed to remove any remnant non-metabolized CMTMR. The cancer cells were placed on the CMTMR-stained CAFs. The co-culture was maintained for 72 hrs. Then, the cells were harvested by trypsynization, analyzed and sorted using FACS Aria II high speed cell sorter with Diva 5.0 software (Becton Dickinson, USA). Based on the FSC and SSC cytogram, live cells were gated to exclude all dead cells, cell debris and cell clumps. Within the gated cell populations, fluorescing cells were identified as CMTMR-labelled carcinoma-associated fibroblasts and non-fluorescent as cancer cells. Excitation wavelength used was 488 nm, whereas emission wavelength used was 578 nm. Cancer cells were sorted into RPMI 1640 medium in 15 ml polypropylene tubes (BD Biosciences). The CAFs grown as a mono-culture were stained using Orange CellTracker fluorescent dye CMTMR, as described above. The cells grown on plastic were fixed in 70% ethanol (10 min), washed in PBS three times and the coverslips were mounted on microscope slides using ICN mounting medium. The cell imaging was performed on confocal laser scanning microscope FV-500 system (Olympus Optical Co, Germany) after 1 hr, then after 72 hrs after the staining. The excitation/emission were: HeNe 543 nm laser with 610 nm filter for CMTMR staining. The cells were examined using the Fluoview program (Olympus Optical Co., Germany). The pictures have been analyzed using a computer-assisted image analyzer (Olympus Microimage™ Image Analysis, software version 4.0 for Windows, USA). To assess the migration ability of cancer cells grown as a co-culture with CAFs, we applied a wound-healing test. The cancer cells (grown as the co-culture with CAFs at the 5:1 ratio, and normal control cells) were separately seeded in multi-well plates and then, (after 72 hrs when the cells were confluent) using a pipette tip (100 ul) a straight scratch had been made, simulating a wound. The images were captured at the beginning and at regular intervals (after 2, 4 and 6 hours) during cell migration to close the wound. The images then were compared to quantify the cells' migration rate. This method is particularly suitable for studies of cell-cell interaction on cell migration . The pictures have been analyzed using a computer-assisted image analyzer (Olympus Microimage™ Image Analysis, software version 4.0 for Windows, USA). Cancer cells were treated with trypsin and resuspended in culture medium. 35 mm culture plates (Corning Inc.) were coated with 100 μl of growth factor reduced Matrigel (BD Biosciences) and left to solidify for 30 min. at 37°C. The control cells were then plated at a concentration of 104 cells/ml. Co-cultured cells were plated at the same concentration (cancer cells and CAFs at 5:1 ratio). The growth of cells on Matrigel was observed everyday under phase-contrast microscope (Olympus). The sorted cancer cells grown as a co-culture were centrifuged (2,500 rpm for 5 min), whereas cancer cells grown as mono-cultures were washed with PBS and harvested by trypsynization and centrifuged (2,500 rpm for 5 min). The total RNA from the samples was isolated using a Total RNA kit (A&A Biotechnology, Poland) according to the manufacturer's protocol. The isolated RNA samples were dissolved in RNase-free water. The quantity of the isolated RNA was measured using NanoDrop (NanoDrop Technologies, USA). The samples with adequate amounts of RNA were treated with DNaseI to eliminate DNA contamination. The samples were subsequently purified using RNeasy MiniElute Cleanup Kit (Qiagen, Germany). Finally the RNA samples were analyzed on a BioAnalyzer (Agilent, USA) to measure the final RNA quality and integrity. The total RNA (10 μg) of each cell line was reverse-transcribed using SuperScript Plus Direct cDNA Labeling System, (Invitrogen, USA) according to the manufacturer's protocol for each microarray slide. Single-strand cDNAs were stained with Alexa 647 and Alexa 555 (Invitrogen). Dog-specific oligonucleotide microarray slides Canis familiaris V1.0.1 AROS (Operon, USA) with 25,383 probes were used for the hybrydization. Hybridization was performed using automatic hybridization station HybArray12 (PerkinElmer, USA). Two replicates were made (dye-swap). The slides were analyzed using microarray scanner ScanArray HT and ScanExpress software (PerkinElmer, USA). The mRNA sequences of the key genes were obtained from NCBI database. Primers were designed using PRIMER3 software (free on-line access) and checked using Oligo Calculator (free on-line access) and Primer-Blast (NCBI database). Primers' sequences are listed in Table 1. HPRT and RPS19 genes were used as non-regulated reference genes for normalization of target gene expression [19, 20]. Quantitative RT-PCR was performed using fluorogenic Lightcycler Fast Strand DNA Sybr Green (Roche) and the Light Cycler (Roche). The results were analyzed using comparative Ct method . Relative transcript abundance of the gene equals ΔCt values (ΔCt = Ctreference - Cttarget). Relative changes in transcript are expressed as ΔΔCt values (ΔΔCt = ΔCtco-culture - ΔCtcontrol). The experiment was conducted three times. Primers sequences used in this study and their annealing optimal temperature and time. The mRNA sequences of key genes were obtained from NCBI database. Primers were designed using PRIMER3 software (free on-line access) and checked using Oligo Calculator (free on-line access) and Primer-Blast (NCBI database). HPRT and RPS19 genes were used as non-regulated reference genes for normalization of target gene expression [19, 20]. In the analysis of differential gene expression, background-corrected value of signal in each microarray channel was used. Prior to the analysis, non-specific filtering was performed, i.e. genes with small level of expression were removed (we set an arbitrary threshold according to which at least half of the samples' expression was to be at least 100). This reduced the number of genes down to 24 842. Then the log2 ratio of the sample vs control channels was calculated and the signal was loes normalized. Quality control, including MA analysis, and signal normalization were done with the Bioconductor software. The analysis of differential expression was performed using linear methods for microarrays (limma package in Bioconductor software) . The method tests the null hypothesis of no differential expression between the sample and control groups using the moderated t-statistic , which has similar interpretation as the ordinary t-test statistic. We identified 206 genes with the p-value below 0.05 and fold change > 2.0. The microarray data discussed in this publication has been deposited in NCBI's Gene Expression Omnibus and is freely accessible through GEO Series accession number GSE29601. The gene function was identified using the NCBI database and PANTHER pathway analysis software . The pathway analyses were conducted using binominal statistic test (PANTHER) with the cut-off value p < 0.05. The statistical analysis of optical density, wound healing assay and Real-time qPCR was conducted using Prism version 5.00 software (GraphPad Software, USA). The one-way ANOVA, and ANOVA + Tukey HSD (Honestly Significant Difference) post-hoc test as well as t-test were applied. The p-value < 0.05 was regarded as significant whereas p-value < 0.01 and p-value < 0.001 as highly significant. The histopathological and immunohistochemical assessment of the tissue sample, from which the carcinoma-associated fibroblasts were isolated, showed that the tumour type was a complex carcinoma of the 1st grade malignancy (Figure 1a). The histopathological and immunohistochemical analysis of the isolated cells (Figure 1b) revealed that the cell line did not express cytokeratin, S100 protein, p63 protein and actin, whereas a strong vimentin expression was detected (at the level of 3 in 0-3 scale) (Figure 1c). The analysis confirmed that the isolated cell line is an atypical colony of fibroblasts which are termed the CAFs. Cancer associated fibroblasts isolated from canine mammary cancer. Representative pictures of A. Canine mammary complex carcinoma (HE staining) tissue from which the carcinoma-associated fibroblasts were isolated. B. The culture of carcinoma-associated fibroblasts (CAFs) isolated from the canine mammary complex carcinoma (HE staining) and C. Carcinoma-associated fibroblasts (CAFs) isolated from canine complex mammary carcinoma revealed a strong vimentin expression (brown color). The pictures were obtained using Olympus BX60 microscope (at the magnification of 200×). The Flow-Cytometry easily distinguished the CMTMR-stained cells from the unstained ones (Figure 2a) and allowed the proper further sorting of each population (Figure 2b, c). The co-culture was maintained for 72 hrs. According to the manufacturer's instruction, CMTMR probes remain vividly fluorescent for at least 72 hrs after incubation in fresh medium at 37°C and through at least four cell divisions. The confocal observations confirmed that after 72 hrs of the staining with the CMTMR all the cells showed red-staining cytoplasm pattern (Figure 2c, d, e). No detrimental effects on proliferation and plating efficiency was observed. Our analysis of optical density of the red dye in the cells measured 1 hr and 72 hrs after the staining showed very similar results (any statistically significant difference had not been found) (Figure 2f). It indicates that there wasn't any staining loss, thus we suppose that the dye wasn't leaking from CAFs to stain cancer cells. It had been also suggested in the subject literature . Moreover, confocal microscopy analysis of the red dye fluorescence with Nomarski Interferenced Contrast showed that all of the stained CAFs maintained their staining pattern after the 72 hrs. Thus, the artificial sorting of unstained CAFs as cancer cells is not very probable. Our FACS sorting isolated a 97-99% pure population on postsort (assessed by BC FACS Diva 5.0 software) what was checked by FACS (Figure 2b, c) and fluorescence microscopy (data not shown). Previously published study of the human fibroblasts and epithelial cells sorting based on the cell tracker staining showed similar results . Histogram and pictures of unstained cancer cells and stained CAFs. A. Representative histogram and sorting gates of unstained cancer cells and CMTMR-stained carcinoma-associated fibroblasts (CAFs) grown as the co-culture for 72 hrs. B. Histogram of cancer cells sorted from co-culture showing only CMTMR-negative cells. C. Histogram of CAFs sorted from co-culture showing only CMTMR-positive cells. D. and E. Representative pictures obtained using confocal microscopy showing red-colored stained cytoplasm (CMTMR staining) of CAFs growing as a single culture for 1 hr and 72 hrs, respectively. The imaging of cells was performed on confocal laser scanning microscope FV-500 system (Olympus Optical Co, Germany). The cells were examined using the Fluoview program (Olympus Optical Co., Germany). F. The graph showing mean optical density of the red (reflecting CMTMR staining) in CAFs at 1 hr and 72 hrs after staining. For statistical purposes the t-test has been applied (Graph Pad 5.0), no significant difference has been observed between these two values. The wound healing assay showed that in all the cancer cell lines the co-culturing with CAFs increased their migratory abilities (Figure 3). CMT-U27 cells grown with CAFs almost completely closed the wound (99%) in 6 hours, whereas CMT-U27 control cells after 6 hrs closed 68% of the wound. Similarly, CMT-U309 and P114 cells (grown with CAFs) after 6 hrs completely closed the wound (100%), whereas control cells closed only 55% and 50% (respectively) of the wound. CMT-W1 cells grown with CAFs completely closed the wound after 4 hrs, whereas CMT-W1 control cells after 6 hrs (after 4 hrs 64% of the wound was closed). CMT-W2 cells grown with CAFs closed 93% of the wound after 6 hrs, whereas control cells closed only 52% of the wound. Wound healing assay of canine mammary cancer cells grown in control conditions and as a co-culture with CAFs. A Representative pictures of migration (wound closing) of CMT-U309 cell line grown as a mono-culture and co-culture with CAFs at 0, 2, 4 and 6 hrs after the scratch was made. B The graphs of % of wound closure after the 2, 4 and 6 hrs of migration. The pictures were taken using phase-contrast microscopy (Olympus) at the magnification of 100×. The statistical analysis was performed using Prism version 5.00 software (GraphPad Software, USA). The one-way ANOVA was applied to analyze the results. p < 0.05 was regarded as significant and marked as *, whereas p < 0.01 and p < 0.001 were regarded as highly significant and marked as ** and ***, respectively. To assess the ability of the cell lines to matrix invasion, we have assessed their growth characteristics on Matrigel matrix (Figure 4). After 72 hrs of culturing (similarly as in all experiments) on Matrigel CMT-U27, CMT-U309 and P114 cell lines formed colonies, whereas CMT-W1 and CMT-W2 cell lines formed branching structures (Figure 4a) what indicated their invasive phenotype. However, all the cell lines grown as a co-culture with CAFs after 72 hrs were dispersed (Figure 4b) what indicated increase of their matrix invasion ability by CAFs. Canine mammary cancer cell lines growth characteristics in Matrigel matrix. A Growth characteristics of CMT-U27, CMT-U309, P114, CMT-W1 and CMT-W2 cell lines (phase contrast micrographs) grown on Matrigel matrix for 72 hours. 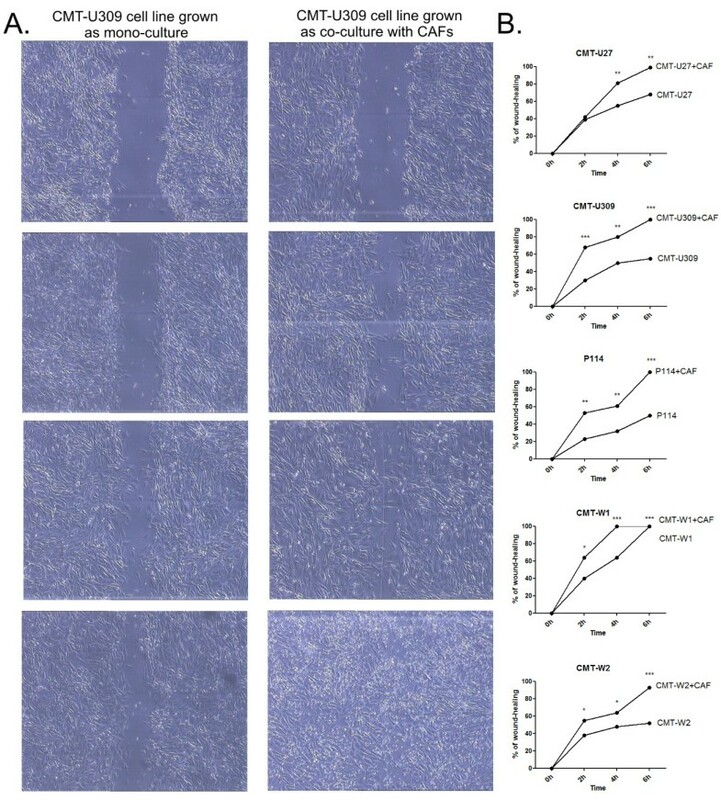 B Growth characteristics of CMT-U27, CMT-U309, P114, CMT-W1 and CMT-W2 cell lines (phase contrast micrographs) grown as a co-culture with CAFs on Matrigel matrix for 72 hours. The pictures were taken using phase-contrast microscopy (Olympus) at the magnification of 200×. The gene expression analysis showed similar rate of gene expression in each of the dye-swap experiment. This result indicates that all microarray samples were successfully labeled, hybridized, and scanned. The discriminating analysis (with p value cut-off < 0.05; fold change > 2.0) revealed 106 up-regulated (Table 2) and 100 down-regulated (Table 3) genes in cancer cells grown as a co-culture with the CAFs in each of the slides. These up/down-regulated genes were common for each cell line examined individually, compared to the same cell line grown as a mono-culture. Thus, these genes were activated/inactivated in all of the cell lines under co-culture conditions with the CAFs. The list of up-regulated genes in cancer cells grown as a co-culture with carcinoma-associated fibroblasts (CAFs). Gene ID, name, molecular function and biological process are listed according to the Panther Database classification www.pantherdb.org. The analyzed genes were significantly up-regulated at the level of p < 0.05, fold change > 2.0. The list of down-regulated genes in cancer cells grown as a co-culture with carcinoma-associated fibroblasts (CAFs). Gene ID, name, molecular function and biological process are listed according to the Panther Database classification www.pantherdb.org. The analyzed genes were significantly down-regulated at the level of p < 0.05, fold change > 2.0. The PANTHER binomial statistics tool to compare classifications of multiple clusters of lists to a reference list of Canis familiaris genes allowed us to statistically determine over-manifestation of PANTHER biological process and pathways classification categories. The PANTHER biological process analysis revealed that most of the up-regulated genes in cancer cells grown as a co-culture with the CAFs were involved in: cell surface receptor linked signal transduction (p = 9.05E-03), lysosomal transport (p = 9.2E-03), developmental process (p = 3.64E-02), antigen processing and presentation (p = 4.22E-02), signal transduction (p = 4.35E-02), cell communication (p = 4.55E-02), nervous system development (p = 4.97E-02). Because our concern involved interactions between cancer cells and carcinoma associated fibroblasts which could predispose cancer to metastasis, we specifically focused on the up-regulated genes involved in cell adhesion and cellular morphogenesis: QRICH2, CHAD, FOXQ1, PCSK6, CLEC7A, SH3BP1, NEFM, PCDH19, LPHN2, DSP, KTN1, VCAM1, MAG, and PTPN6 (Table 2). Interestingly, the gene expression analysis also revealed an up-regulation of 24 genes involved in developmental processes such as: a mammary gland development, a mesoderm development, an ectoderm development, a skeletal system development, a nervous system development, an embryonic development, a heart development, and a muscle-organ development. The pathway analysis revealed that significantly over-manifested were: the salvage pyrimidine ribonucleotides (p = 02.87E-03), the oxytocin receptor mediated signaling pathway (p = 4.76E-03), the thyrotropin-releasing hormone receptor signaling (p = 5.21E-03), the 5HT2 type receptor mediated signaling pathway (p = 6.99E-03), the metabotropic glutamate receptor III (p = 8.14E-03), the metabotropic glutamate receptor group II (p = 3.33E-02), the metabotropic glutamate receptor I (p = 1.75E-02), the Beta 2 and Beta1 adrenergic receptor signaling (p = 2.54E-02) and the histamine H1 receptor mediated signaling (p = 2.87E-02). Among the down-regulated genes no significant pathways or biological processes and their over-manifestation were found (Table 3) comparing to a reference list of Canis familiaris genes. For the purposes of the microarray data validation, we have randomly selected 3 of all the genes that may play the most important role in the cancer cells-CAFs interactions: PCDH19, DSP and MAG. Real-time qPCR results showed similar trends in gene expression changes as were observed in microarray studies (Figure 5). Selected genes expression assessed using real-time qPCR. Expression of randomly selected genes in canine mammary cancer lines growing as a monoculture and co-culture with CAFs. The changes in gene expression differed highly significant (p < 0.001, N = 3). Because the MAG gene up-regulation was found in cancer cells grown as a co-culture with the CAFs, the expression of MUC1 (which binds MAG) was examined immunohistochemically (Figure 6). The MUC1 expression was confirmed in all of the examined cell lines. MUC1 expression in canine mammary cancer cell lines. MUC1 expression (brown color) in canine mammary cancer cell lines: A. CMT-U27, B. CMT-U309, C. P114, D. CMT-W1 and E. CMT-W2. The pictures were obtained using Olympus BX60 microscope (at the magnification of 200×). Canine mammary cancers in bulk arise from epithelial cells. Several genetic alterations have been detected, that may predispose these cells to the malignant transformation [10–12]. However, researches over the last few years suggested that concomitant changes also occur in stromal cells that form the tumour microenvironment [1, 2]. The hypothesis of stromal cells involvement in tumorigenesis is based on a study of embryological development where interactions between various cells are necessary for programming and maintaining epithelial structure and function. The embryonic epithelial and stromal cells of mesenchymal origin engage in a molecular dialogue that ensures the proper organ development and function . The study showed in cancer cells after a co-culture with CAFs an up-regulation of 23 genes (Table 2) involved in developmental processes (a nervous system development, an embryonic development, a mesoderm and ectoderm development). The involvement of fibroblasts in the malignant transformation of epithelial cells has previously been documented [3, 26–28]. Moreover, the histology and growth characteristics of CAFs were found different from those of the fibroblasts associated with normal epithelial cells . Mishra et al. have proposed bidirectional cross-talk between the CAFs and the cancer cells which release proteins that increase the fibroblasts ability to secrete a variety of tumour-promoting factors, which then act back on the malignant cells to change their gene expression and promote their proliferative, migratory, and invasive properties. On the other hand, other studies showed that only direct contact of fibroblasts with cancer cells is able to cause changes in their gene expression and biology [30–32]. So far several papers have been published about gene expression in tumour microenvironment. Most of them describe gene expression in fibroblasts, but not in cancer cells, however there are some papers available about the changes in gene expression in cancer cells [33–36]. These reports indicated up-regulation of genes involved in angiogenesis, EMT and migration in cancer cells grown with fibroblasts. Surprisingly, some of the genes identified, even though functionally identical turned out to be of different names. The studies have been conducted using various cancer models (various species) and various cell lines, so the differences are possible. The results of the study hereby revealed increased expression of 13 genes involved in cell adhesion (Table 2) among cancer cells co-cultured with the CAFs. As much as 10 of them are involved in developmental processes as well. These genes seem to be particularly significant because the cell adhesion is responsible for tumour progression and metastasis, detachment from the primary tumour and spreading to the circulatory system. Moreover, the up-regulated genes responsible for adhesion are by rule involved in angiogenesis and lymphangiogenesis. For example, the vascular cell adhesion molecule-1 (VCAM-1) up-regulated in cancer cells grown as a co-culture with CAFs may be involved in tumor progression and metastasis particularly via lymphangiogenesis promotion [37, 38]. It also has previously been demonstrated that the VCAM-1 plays a crucial role in the endothelial-carcinoma cell adhesion . The study also revealed an up-regulation of desmoplakin (DSP), which is a key component of cellular adhesion junctions known as desmosomes. These junctions are found at contact sites between endothelial cells that form capillaries, thus DSP play a role in de novo capillary formation and branching during tumourigenesis, embryonic development and cardiovascular development . Moreover, desmoplakin isoform 2 was only detected in tumours associated with a poor clinical outcome. It may suggest its potentially specific function in the regulation of cancer cells proliferation, differentiation, invasion and metastasis [40, 41]. Moreover, desmosomes may also be important in the epithelium-mesenchymal transition (EMT). The epithelium-mesenchymal transition is an indispensable mechanism for morphogenesis during embryonic development, and is implicated in conversion of early-stage tumours into invasive cancers. During EMT, epithelial cells undergo changes in morphology and acquire the migratory and invasive characteristics of mesenchymal cells . EMT is also promoted by the FOXQ1, another up-regulated gene in cancer cells grown under co-culture conditions with the CAFs . It also increases expression of several junction proteins promoting cancer cells to gain the stem-cell-like properties and ensuring resistance to apoptosis [42–44]. Moreover, the down regulation of keratin 20 (Table 3) in cancer cells following the co-culture with the CAFs may indicate the EMT induction [45, 46]. Interestingly, another up-regulated gene in cancer cells grown with the CAFs, which contributes to cancer invasion is myelin-associated glycoprotein (MAG) that binds to the oncogenic glycoprotein MUC1 . Swanson et al. described an interaction between the MUC1 and the MAG in cancers that invade perineurally, including prostate, salivary, and breast carcinomas. Furthermore, breast cancers may metastasize to the brain where the MAG is abundantly expressed. Interactions between the MUC1 and the MAG have not fully been defined yet. We confirmed the MUC1 expression in all of the examined cell lines (Figure 6). Thus, based on our own observations and those of Swanson et al. , we suppose that the MAG up-regulation in cancer cells grown with the CAFs and its binding to the MUC1 may contribute to the adhesion between tumour cells and Schwann cells promoting metastasis to the nervous system. We also found a down-regulation of 5 key genes associated with adhesion. Subject literature suggests 3 of them play a role in cancer development. The down-regulation of these genes is associated with poor prognosis and cancer metastases. One of these genes is the ADAMTS15 (a disintegrin and metalloproteinase with thrombospondin motif 15) which is an anti-angiogenic factor . Our study also revealed a down-regulation of the CADM4. Nagata et al. found decrease in the CADM4 expression in most of renal cell carcinomas and the cancer cell lines. Moreover, the CADM4 expression was decreased in carcinomas with vascular infiltration, suggesting that loss of the CADM4 is involved in tumour angiogenesis and invasion. We have also found a down-regulation of the MATN1 gene which has been defined an angiogenesis inhibitor . In the current study we showed a significant over-manifestation of genes involved in the oxytocin receptor mediated signaling pathway, the thyrotropin-releasing hormone receptor signaling, the Beta 2 and Beta1 adrenergic receptor signaling, and the histamine H1 receptor mediated signaling in cancer cells grown with the CAFs. Entschladen et al. described the role of neurotransmitters in cancer progression and metastasis. They found that similarly to chemokines, neurotransmitters are regulators of cell migration. Sadly though, we noticed that only a few results are available on the expression of neurotransmitter receptors in tumour tissues. Among them the best understood is the role of catecholamines in carcinogenesis and tumour progression. These are the stress hormones, whereas stress in turn is a major risk factor for the development of cancer. Norepinephrine has been shown to strongly induce the migration of tumor cells [52, 53], whereas epinephrine was found a modulator for the carcinogenesis in the lung . An interesting gene in cancer cells grown as a co-culture with the CAFs is the up-regulated protocadherin 19 (PCDH19) (Table 2). Up-to-date there is no information available on the involvement of this gene in tumor progression or metastasis. However, a PCDH19 mutation was found to be responsible for epilepsy and mental retardation confined to females (EFMR) . There has been an on-going debate about the relationship between epilepsy and cancer. It has been hypothesized that the incidence of cancer is increased in people with epilepsy owing to the cancer promotion by antiepileptic drugs . Perhaps the increased risk of cancer in epileptic patients is caused by the PCDH19 mutation and over-expression, not however related to drugs toxicity. This hypothesis requires further studies. The results of the current study showed that the co-culture of cancer cells and the CAFs caused significant changes in expression of genes involved in adhesion, angiogenesis and the EMT that take part in developmental processes. This work was supported by grant no N N308012939 from Ministry of Sciences and Higher Education. This work was performed by financial support of the Foundation for Polish Science (Start stipendium and Parent-Bridge program). The authors would like to thank Dr. Małgorzata Gajewska for the confocal analysis and Dr. Alicja Majewska for Bioanalyzer analysis. MK: research design, experimental design, FACS cell sorting, CAFs isolation, manuscript and figures preparation; KP: cell culturing, CAFs isolation, RNA isolation, microarray analyses; KS: real-time qPCR; HM statistical analysis of microarray experiment; ID: histopathological examination of tumour sample and CAFs; EM: immunohistochemical examination; MJ: microarray analysis; TM: manuscript preparation. All authors read and approved the final manuscript.